Invite your family and friends to the show! Our 11th Annual Juried Exhibition is selected, by juror Judy Morris, and is going up this week. Our opening reception is Friday evening, 6-8. In case you missed the email with the e-invite, here it is again. Just right-click copy and save to your computer, then send as attachment, or insertion, to your friends, family and clients. Also please read the detour instructions. It’s a little complicated this year. Creative Art Gallery personnel are going to put extra signs up Friday to help folks find their way. Due to recent and temporary road construction on the Arsenal Street bridge, detours have been planned for accessing Creative Art Gallery by the St. Louis City Street Dept. These route changes will be in effect between February 25th and May 21st 2010. 1- Exit at Arsenal, make right onto arsenal. 2- At light, make left onto Jamieson. Continue on Jamieson to Fyler. 3- At Fyler make left. Continue on Fyler to Watson. 4- At Watson make left. Continue on Watson to Bradley (first street on left). 5- At Bradley make left. Continue 1 block to Ivanhoe Avenue. 1- Exit at Jamieson. Make right onto Jamieson. 2- At Fyler make left. Continue on Fyler to Watson. 3- At Watson make left. Continue on Watson to Bradley (first street on left). 4- At Bradley make left. Continue 1 block to Ivanhoe Avenue. 1- Exit at McCausland. Head south on McCausland to Arsenal. 2- Make left at Arsenal. 3- Make right onto Jamieson. Continue on Jamieson to Fyler. 4- At Fyler make left. Continue on Fyler to Watson. 5- At Watson make left. Continue on Watson to Bradley (first street on left). 6- At Bradley make left. Continue 1 block to Ivanhoe Avenue. This may add a few minutes to your travel time depending on lights and traffic conditions. 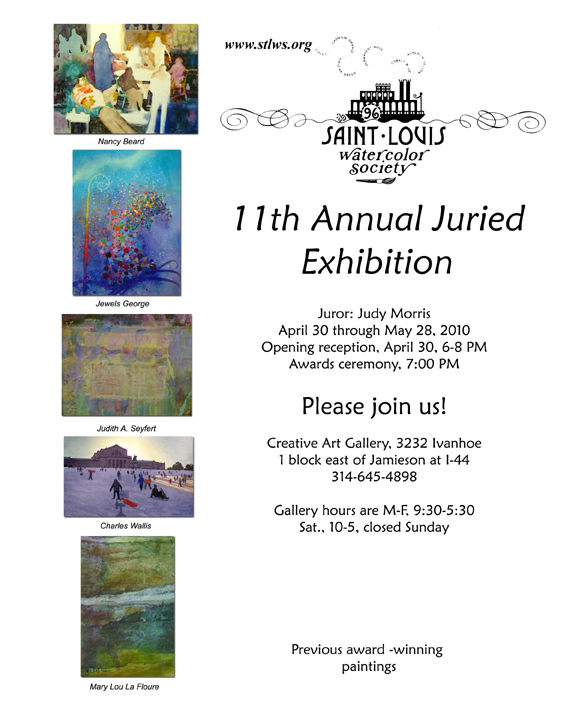 We apologize for any inconveniences this may cause and hope to see everyone at this year’s 11th Annual St. Louis Watercolor Society Juried Exhibition!